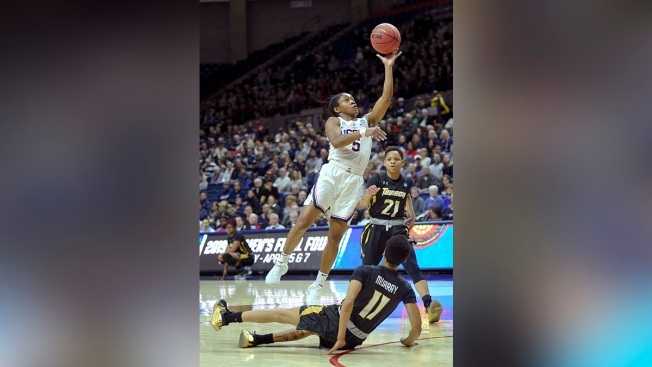 Connecticut's Crystal Dangerfield (5) goes up for two points against Towson's Qierra Murray (11) during a first round women's college basketball game in the NCAA Tournament on March 22, 2019, in Storrs, Conn.
Kionna Jeter had 20 points for Towson, which was making its first NCAA Tournament appearance and finishes the season 20-13. UConn, in its 31st consecutive tournament appearance, put this one away early. Megan Walker (16 points) opened the scoring with a jumper and her 3-pointer from the right baseline capped an opening 11-1 run. A 3-pointer from Dangerfield gave the Huskies their first 30-point lead at 46-14. UConn hit 59 percent of its shots in the game and led 64-24 at the half. Towson: The Tigers posted their first 20-win season since 2007-08, first winning season since 2011-12 and first Colonial Athletic Association championship.